How to put a 2.1 speaker system into an EGRET II with or without intrusive measures. Very easy to do as long as you know how to do it and what you’ll need. 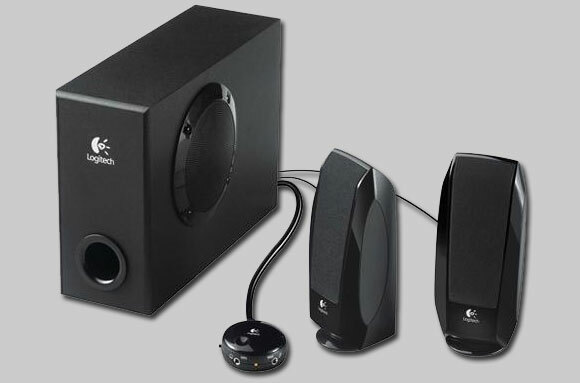 Speaker choice After a whole-heartily recommendation (i.e. “these are cheap, mate”) I went with the Logitech s220 as they are at an extremely good value. 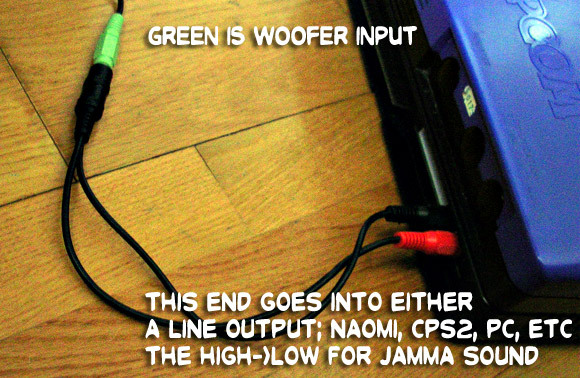 If you plan on keep running your JAMMA PCBs in your cabinet and not only stereo, line-output systems such as CPS2, NAOMI, a PC or gaming consoles, besides a set of 2.1 speakers you’re gonna need more stuff. Monouchi alerted me on the fact that you HAVE to turn the volume all the way down on the EGRET II’s built-in volume control, or your high->low converter will eventually stop working. Running the PCB’s sound on low volume is recommended as well. You should notice distorted audio if you run your games volume too high as well. 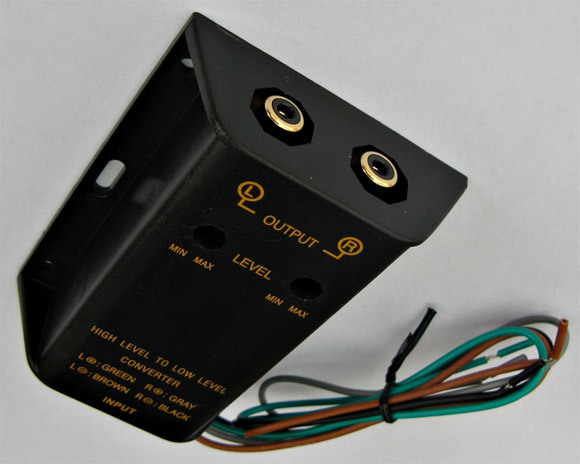 Locate (then buy a couple of) the JST connectors that matches the ones that are attached to your original speakers and attach those to the “input” side of your “high to low” converter. 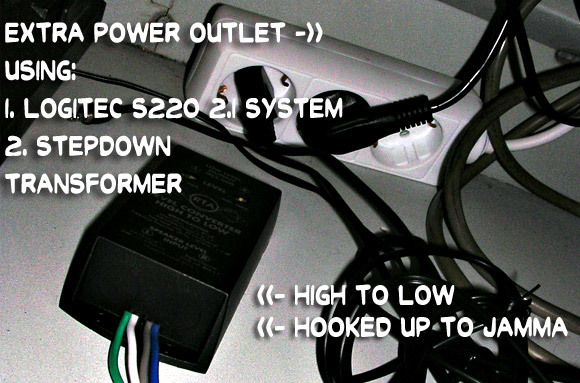 Too find the pinout you might want to open the original speakers carefully as I myself went the “lesser” way now referred to as #2 (as I never thought of this clever JST trick, thanks to monouchi for figuring that one out). And then your high->low work is done. A bit down is also monouchi’s very clever mounting for the “high to low” converter. To my knowledge this is harmless (the mono->dual mono thing), that’s not saying there’s not a better, “proper” way though. Not a “permanent” solution, but easy to remove if you only want to try this and option 1 or 2 is not an option for you. ALL HOOKED UP, NOW WHAT? You put the speaker in place from the front (look at the cable coming from the speaker) and wiggle it gently into the hole in the bezel surround. You’ll feel that the friction will “grip” the speaker. The first time, I thought about securing it a bit more with masking tape, but it fits real snug without it. 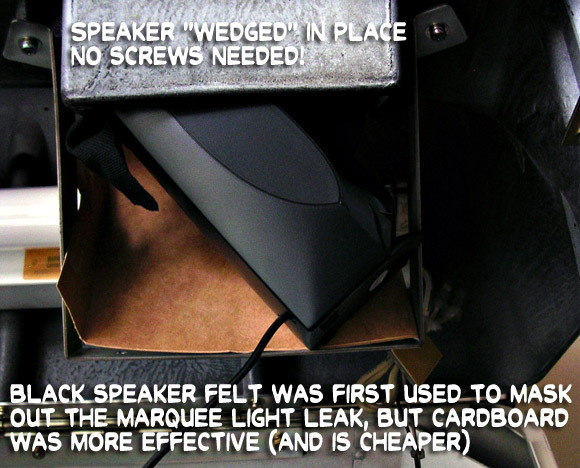 Once the speaker is in place, you put the cardboard between the marquee light and the speaker. The speaker will hold it in place and you won’t get irritating light leak from the speaker containers. 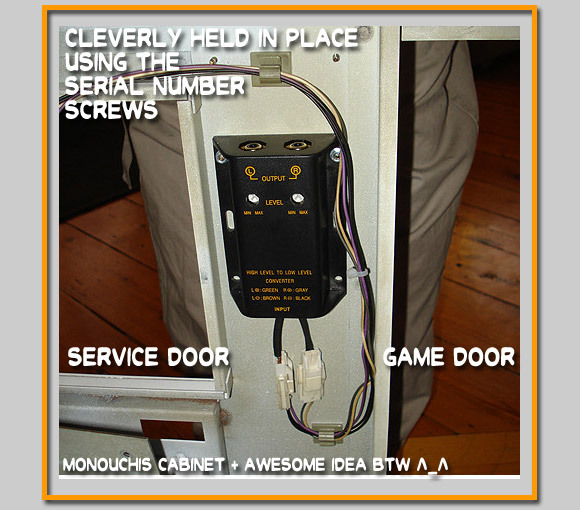 You can put it behind the coin box, like I did, or somewhere else in the back of the cabinet. I chose this spot because I just don’t like to imagine the magnetism breaking any of my PCBs (if this is possible). In the picture below, you’ll see the bass knob, and right below is where the top speakers are connected. 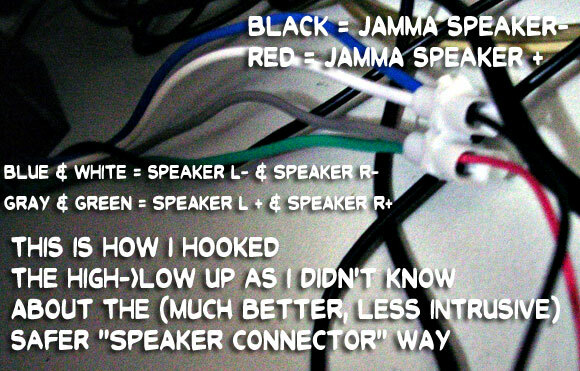 Under the speaker output, you have the line input wire. I’ve set my bass level to maximum, and it feels perfect. I’m not even bass crazy. No, I haven’t had time to make the wiring all neat (below), but everything works just fine. You don’t see any wire coming OUT from the “high to low” converter, because I have a CPS2 mobo hooked up right now, straight to the sub woofer. 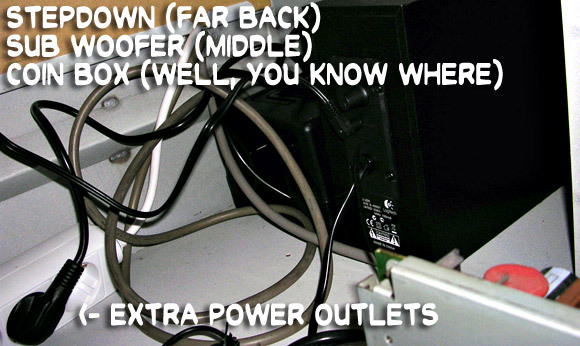 Here you can see external, non-JAMMA audio hooked up on the floor right outside the cabinet. I took the CPS2 game out so I could take better pictures of the inside of the cabinet. Hello there emphatic, I am also interested in this. 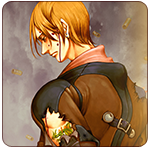 (Please take a look at my most recent article for details.) This was a great read; you have most definitely provided me with some food for thought.